Hey you! You haven't posted since Saturday night! Right I haven't and for good reason. First, I have my mind wrapped around a new Beetleweight class robot. 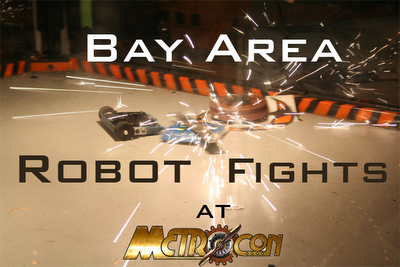 For those joining us now, a beetleweight weighs 3 pounds and competes in combat competitions such as Battlebots (see BARF tags). 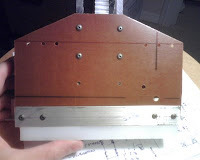 I have spent most of my free time (and there has been much of that) CADing a new robot which is yet to be named. Behold! The micro version of my larger 12-pound robot Attrition. 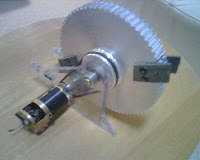 The robot has a nearly 1 pound spinning drum as "x" many RPMs. 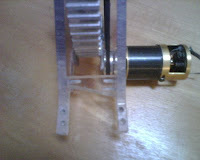 Banebot 25mm, 20:1 gearboxes for drive and lots of recycled parts. Attrition was an extremely innovative and successful robot so I am hoping that this robot will also share its design success. The bad part is that I may not get started on construction because I need some larger machines available at Tech. So it it may be a few months until I can actually get started. Either way, it proves to be a fun project! If you have any name suggestions, let me know (and you know how). The crowd pleaser that never fails to please... okay I will take that back. The first match against "Babe the Blue Bot" was less than ideal because my belt for the weapon derailed like so many times past (I thought I had that fixed!). But the other 4 matches, the bot never failed to bring a smile to the crowd, bouncing off walls and making sparks and parts fly off opponents. 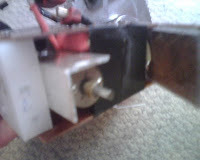 "Cause for Concern" was one such opponent who had his 1/2" lexan frame cracked and his bolts sheered. This bouncing was the demise however when a prime hit on "Verbal Irony 4" sent DDT flying into the pit. It was only a matter of time before it happened anyway. We ran round robin for the beetleweights since there were no as many. Surprisingly, this robot had actually captured the crowd's heart although not being a very good spinner (belt problems, hot motors, slipping blades). The crowd, on hearing Pacman's name announced, would chant "Wakka wakka wakka!" because that's the sound Pacman makes, ha ha. I was even surprised to see that people wanted pictures of me and the robot. I will never forget this one young woman (I'm guessing early 20's) came up to me in the pits after a match and excitedly asked for a picture with me and the robot. I said yes because it would make her happy and because I was honored to know someone wanted a picture with me (plus she was, in my opinion, decently attractive XD). But anyway! Pacman went through opponents by total win or total loss. He ate through some good aluminum pieces of opponents, a few sparks, relatively stable robot. But some really good pushers put him in the pit. Okay, one of those losses probably should not have happened, but it did. When fighting "Push it to the Limit", an impact shook off one of my wheels. But the same impact left him high centered. 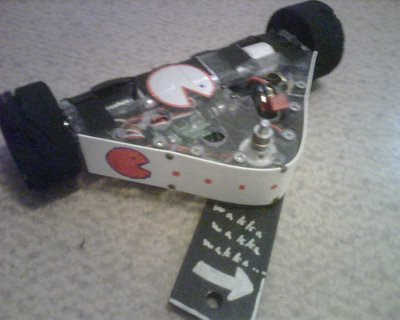 We freed him but i couldn't move because the loss of one wheel made the robot sit at an odd position so Pacman got pit'd shortly after. Oh well, we had fun anyway. Overall it was a heck of a fun event. I always feel a bit strange walking into Anime conventions because the people are way too nice and energetic (and costume-y). But I really enjoy this crowd to be honest. They are overly enthusiastic which makes me feel better about the entertainment that I help provide. They really appreciate it unlike some other events. Videos to come! I still haven't uploaded them yet. Check my Youtube page for more! And additional pictures here! Coming to an event... tomorrow? More pictures on my photobucket and when my mom's camera finishes charging. Excuse Me, is that YOUR Bot? 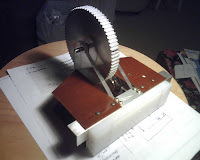 Up until now, I've been having people think that the giant timing pulley robot was my entry for the Beetleweight class this BARF. Well, surprise! I'm taking off the covers, the bot is nothing like expected! Welcome to the new version of Late Night Leftovers (I might change the name to Shark Attack)! 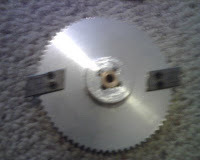 It sports a 9" edger blade, weighing about 9 oz (I think). Total RPMs should come out around 8000-9000 which should really put a punch on the tips! But you ask, what happened to the vertical disk version? I'll tell you, it practically broke it self. When the gigantic disk hit something, it made impacts tangent to the axis at a low angle. So basically, it pushed horizontally against the direction of forward motion. The friction coefficient of the tires are fairly high. So if froward forces are high, but reverse forces are also high and on the same plane, where does the force go? Into the drive motors, because it's the weakest part. Yeah, the 50:1 copals decided to burst: rather just the bushings. Either way, once they blow, I can't fix them easily. Redesign. Here's to a good but short lived bot. You were interesting and adorable. Farewell. One more day till BARF. Better keep building. It's over. The robot was completed yesterday evening for a grand build of 2 days. 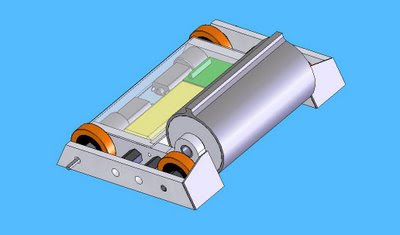 This of course, is nothing compared to a previous robot of mine, which was built in 3 hours. Regardless, it is a very mean machine and very unbalanced. Let's say, most of the design is put towards the offense, making it incredibly hard to turn. 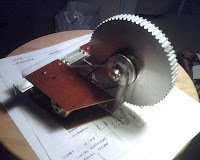 If anyone wants to calculate physics here: 5" solid disk, ~11,000 RPMs, ... yeah. But it nonetheless, works well. I think I will try it out at Metrocon, and if I don't like the results, then I will revise the main weapon supports to add maneuverability. A shot of the weapon disk. It totals at 14.4oz (for a 3 pound robot, that heavy!). 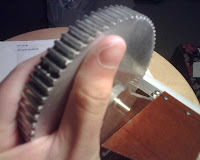 I spent 2 hours, and about 9 cutting disks shaping those titanium teeth. Last night I went to see Pixar's "Up" in theaters with my friend, Allyssa (The movie was absolutely wonderful!). Today, I relax by myself and do what I normally do: build robots. 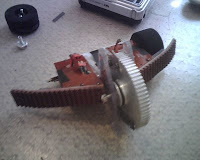 Yes, today I spent (wasted) my time building yet another Battlebot per the Robot Fighting League (RFL). This particular robot, is a beetleweight (3 pounds) and sports a large spinning disk that spins ~10,000 rotations per minute (RPMs). What makes this robot particularly interesting is the fact that I am using all my spare parts and spare materials. It will certainly make for an interesting design because it pretty much forces me to design in reverse to what I typically do. Introducing the robot whimsically named... "Late Night Leftovers"